Acupuncture is a treatment method based on Traditional Chinese Medicine (TCM). The practitioner inserts very thin needles in specific points (Acu-points) along energy pathways (meridians). The stimulation of those points helps to adjust and balance the flow of energy and restore health. According to the National Institute of Health, over one million people in the US receive acupuncture annually. There is evidence that the stimulation of acupuncture points can affect internal organs by means of nerve reflex pathways (the autonomic nervous system). Acupuncture increases the release of natural pain-relieving chemicals called endorphins. It stimulates the pituitary gland, which in turn activates the adrenal gland to release anti-inflammatory chemicals. It is a fact that acupuncture has helped millions of people to eliminate or decrease pain, improve their immune system and achieve better overall health worldwide. The list of conditions that acupuncture treats or alleviates is long. Here you can find the WHO report containing research data. 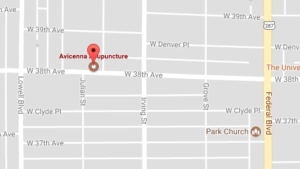 At Avicenna Acupuncture, we specialize in the treatment of fibromyalgia and it’s co-existing conditions. Unlike hypodermic needles, acupuncture needles are ultra thin and flexible, thereby permitting a nearly painless insertion. The sensation could be compared to a mosquito bite. You may feel some heaviness, distention and/or tingling either around the needle or traveling up or down the affected meridian. Most people feel relaxed during and after the treatment. If provided by a trained professional, acupuncture is considered very safe. We exclusively use sterile, disposable and individually packaged needles as required by law. Every licensed acupuncturist has completed a “clean needle technique” class and exam. All practitioners at our Denver office have received at least 180 hours of course work concerning needling technique and safety. Additionally we observed and practiced the insertion and removal of needles during multiple internships for more than 1000 hours under supervision of licensed staff. Tui Na is a stimulating and therapeutic Chinese massage. In Tui Na we use traction, massage and manipulation in conjunction with the stimulation of acupressure points. It is used for both acute or chronic musculoskeletal conditions, as well as certain non-musculoskeletal conditions. It is an integral part of Traditional Chinese Medicine. Moxa – the dried leaves of the Chinese herb – Ai Ye (Artemisia vulgaris) are burned near acupuncture points. It produces a warm sensation and activates the channels. It is useful in treatment of arthritis, digestive problems and infertility. Moxa is most famous for its function to turn the baby in the womb.